An eye with a shallow anterior chamber is at increased risk for endothelial cell loss during phacoemulsification. A convex anterior capsule increases the risk of anterior capsulotomy “runout”. In this case I discuss and demonstrate techniques that protect the endothelium and prevent capsulorhexis problems in these eyes. 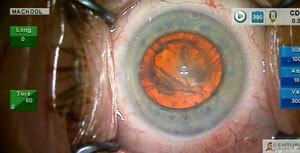 This patient has persistent negative dysphotopsia after cataract-implant surgery performed 18 months ago. 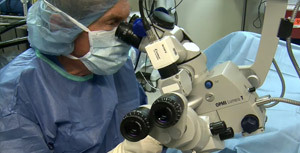 A combination of techniques is used to achieve the desired reposition of the IOL optic (reverse optic capture). Treatment of one diopter of astigmatism is also demonstrated by the placement of 2 penetrating limbal relaxing incisions (PLRIs) at the steep corneal meridian. 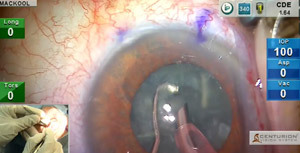 In this case I present a variety of phaco techniques and pearls as cataract extraction and multifocal IOL implantation is performed in an eye with a small pupil and moderately floppy iris. 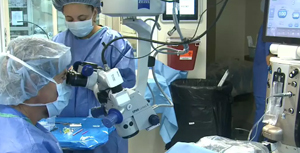 A spit screen is utilized to demonstrate surgeon hand position throughout most of the procedure. This month’s case features methods for dealing with the problem of a patient with a very active Bell’s Phenomenon. 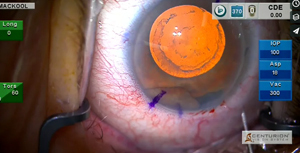 The use and design of my primary chopper to protect the posterior capsule during phacoemulsification, methods to remove extremely adherent lens cortex, and the creation of Penetrating Limbal Relaxing Incisions after implantation of a multifocal IOL are also discussed and demonstrated. 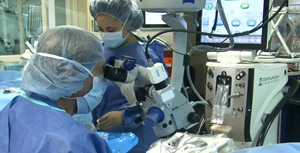 Following a standard cataract procedure, I address the reduction of IOP in this patient with open-angle glaucoma by implanting a stent in the trabecular meshwork. 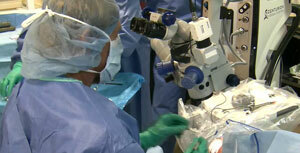 Many patients experience severe photophobia in response to the microscope light. These patients are also often hyperesthetic, and this patient presented with both issues. 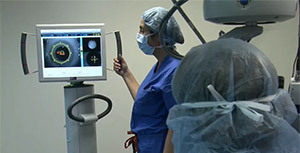 Here I demonstrate the use of the “NLP” (no light perception) technique to eliminate photophobia, the soft lens/no ultrasound phaco method and the use of a low (50 mm Hg) IOP setting during phaco and I/A to eliminate the possibility of discomfort caused by a higher intraoperative IOP in this patient who also had a floppy iris. This patient has a dense cataract, low ocular rigidity and unreliable preoperative biometry. 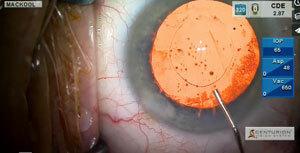 The use of a high flow rate of 55 cc/min* to remove nuclear segments, wavefront aberrometry, and methods to prevent contact of the IOL with the endothelium during the late stages of the procedure are demonstrated.